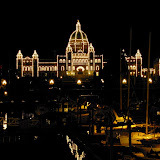 It was time to take another vacation, so this time Jenn and I set our sights on a non-Vegas destination: Victoria, British Columbia. We headed out August 24 - 27. We left Monday morning for Port Angeles, WA, and took the ferry over to Victoria. We stayed at The Hotel Grand Pacific, conveniently on the same block as the ferry. Tuesday we visited The Butchart Gardens. It was pretty amazing, all the different kinds of flowers and gardens they have. Glad I took my allergy pills! After the gardens we went to the top on Mt. Douglas and checked out the view. Definitely something to see, but harder to get to than you might think. Try as we might, we just could not stick on the roads shown on the map. We had quite the adventure getting to Mt. Douglas and saw most of Victoria in the process. Wednesday we took a tour of the BC Parliament Building and learned a bit about the government there. While the architecture was interesting, the best part was going to the visitor gallery and watching parliament in session. There was an argument going on about a proposed new tax system and it was very heated. Way better than C-Span. Thursday morning we had to leave, but before we did we went out to the front of the hotel and watched them feed the ducks. Apparently they have these ducks that come back year after year to swim in the fountain out front and get fed by the maintenance guy each morning. At one point they had close to 60 ducks! We only saw about 30, but it was pretty crazy. In all, a good trip. Left a few things (like the Royal BC Museum) to see on future trips, but saw a lot and had a good time.